Welcome to Holland Christian Middle School. It is a school that thrives on learning more about God’s world through appropriately challenging academics, a wide array of extracurricular offerings, and positive social interactions. 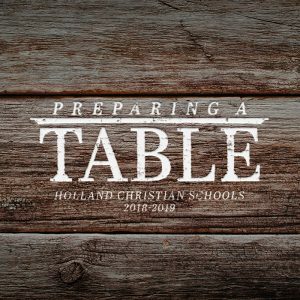 Under the care and instruction of skilled Christian educators, students of Holland Christian Middle School receive a solid formative experience rooted in God’s Word. All our Middle School students receive instruction in the core subjects Math, Social Studies, Science, and Language Arts. In addition, students take courses in Art, Literature, Technology, Bible, Physical Education, Music and many more with all courses seeking to emphasize God’s sovereignty in this world. Our mission at Holland Christian School is, “Equipping minds and nurturing hearts to transform the world for Jesus Christ.” This motto challenges us to not only provide our students with the academic rigor and character shaping experiences necessary for today’s learners, but also instill in our children the vision to participate in God’s redemptive plan here and elsewhere. Truly, there is no place or time where our Lord’s Gospel should not be declared and our witness not needed. We hold a great honor to invite your students to perform that important work in their lives. Thank you for taking the opportunity to explore this website and learn more about our school. But we are a school and not a website. Come and see us, explore our hallways and classrooms and experience Holland Christian Middle School. We would love to meet you and talk with you further.